As I noted in last week’s post at this blog, turning transit boards into really cohesive governing teams is no piece of cake, primarily because the great majority of transit board members are appointed by elected officials. In practice this means that many if not most transit board members feel as – if not more – accountable to their appointing authorities than to their board colleagues. 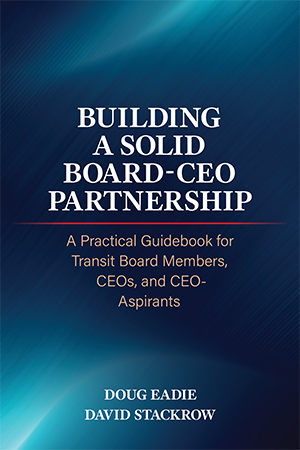 Now matter how stiff the challenge, however, board-savvy transit CEOs know that they’ve got no choice but to help their boards become more effective governing teams for two main reasons. First, teamwork is one of the preeminent keys to making high-impact governing decisions. And, second, the satisfaction that doing really high-impact governing work generates makes board members more reliable partners for the CEO. Board-savvy transit CEOs are well aware that frustrated, dissatisfied board members make for fair-weather partners whose support tends to evaporate when the inevitable you-know-what eventually hits the fan. Last week’s post took a look at one important tool for transforming your board into a more cohesive governing team: involving board members in shaping a detailed “board governing mission” that lays out the board’s ultimate governing goals and outcomes. This post describes two other team-building strategies: developing guidelines governing board members’ interaction with each other; and strengthening board members’ emotional ties. Guidelines aren’t worth the paper they’re written on unless your board pays attention to their observance. In this regard, many transit boards have assigned their board operations (or governance) committee responsibility for monitoring adherence to the guidelines.